Experimente uno de los mejores destinos de avistamiento de ballenas en el mundo en este crucero guiado de 4 horas de observación de ballenas alrededor del Santuario Marino Nacional Stellwagen Bank. Súbete a un catamarán de alta velocidad que llega y sale de las ballenas en el menor tiempo posible. Vea ballenas jorobadas y de aleta, además de delfines blancos del Atlántico y marsopas con la ayuda de un guía naturalista. La cocina a bordo ofrece comidas calientes, aperitivos y bebidas para comprar durante el viaje. 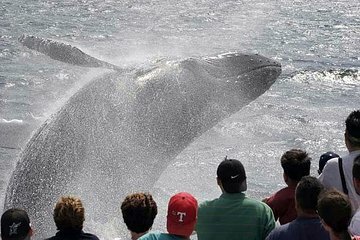 Experimente uno de los 5 mejores destinos de avistamiento de ballenas en el mundo. We took our granddaughter for her first whale watching excursion and we had a great day. Saw 4 humpbacks, including a mom and calf, who played around on the surface for a long time. Crew and staff very professional and knowledgeable. We would recommend to others who are interested. We loved our experience with Cape Ann Whale Watch! We saw tons of whales and the staff was respectful and knowledgeable. I would totally recommend doing this! definitely something different. We would go again. Our doctor recommended the patch and it worked great since we did not get sea sick. However, it is very rare that the whales jump out of the water as they show in advertisements. We got some good pictures and enjoyed it. I've always used Cape Ann Whale Watch when I've gone out in the past over the years,,their staff is Highly Education and extremely courteous to all those who are aboard.. Never ever have been disappointed with this company !!! The only thing that I was disappointed in was we only got to see two whales. which is not the providers fault. It was fun to watch a mother and calf swim around. The calf did a number of roll overs which was fun to watch. We were the only boat in the area which was nice. Spent more time on the DAM boat ride two hours to Cape Cod 45 minutes watching the what whales 3 back to the dock another two hours. That was a waste of time and money!!!!!! I will never ever recommend Gloucester. We enjoy having adult beverages at the Crow's Nest. Very knowledgeable and friendly crew. Boat and facilities were very good. We saw whales ! Great tour! I totally recommend these guys. It was nice and unusual activity. Whales were so close to boat. Very interesting, informative. Great for kids.